When actively looking for a role the candidates first impression of a businesses is the job advert. Writing a great job advert is critical to convincing applicants to press the apply button. Here's some do's and don'ts to crafting a top performing job advert. Repeat the job title up to 6 times - This ensures your advert appears in a strong position in the search listings throughout the advertising period. Ensure job titles are concise - The choice of title is critical. Use the most popular job title for the role. Avoid using fancy titles that candidates wouldn't search for. Make adverts easy for candidates to read and job boards to rank - Make sure your advert has a easy to follow structure. We've found that our adverts are most successful when we split our adverts into four key paragraphs. Don't upload your internal job description - Use your advert to sell the role and sell the company. Ideally this should be done within the first three lines which can be previewed on job boards without clicking into a vacancy. Don't upload an advert under 100 words or over 2,000 - Too short and the advert lacks credibility, too long and candidates will switch off and skip to the next vacancy. We've all done it. Many of us still do it. Some of you might not be aware that it's a naughty thing to do. What could I be talking about? Well, it is, of course...posting a job ad and leaving the vacancy to accumulate applications. In the current market this is a cardinal sin. The early bird catches the worm. Failing to identify and reach out to quality candidates quickly can cost you a great hire. Without regularly checking the talent pool there's a high chance of missing out on that star candidate. The current market is candidate led and talented employees are being snapped up quickly. A recent survey by Reed found that 90% of all candidates say that they will presume they've not been successful if no contact has been made within 14 days. Your applicant assessing needs to be efficient, seamless and lighting quick like Usain Bolt. Failing to do so can bring the whole recruitment process to a grinding holt. Which leads nicely onto the next point. To improve the speed of both identifying skills and getting applicants through the process you need to have the right software in place for the business. Sifting through applications to find the most talented employees can be extremely time consuming especially when the response is spread out between job boards in different digital spaces. Amongst high-growth businesses technology ranks as both the #1 accelerator (37%) and barrier (38%) to growth according to Grant Thornton. Applicant Tracking Systems come in all shapes and sizes with varying features. Below we have listed the top features a high-growth business should look for in a software solution. And there you have it. Three ways to identify and recruit more talent into the business. Do you have the tools available to identify and recruit more talent? Talentvine have three unique solutions to allow businesses to do just that. At Talentvine we've helped thousands of UK businesses of all shapes and sizes to identify and recruit talent. From a Dragons Den Winner, to a Sunday Times Fast track 100 business our digital tool kit is the perfect fit for fast growing, ambitious businesses. 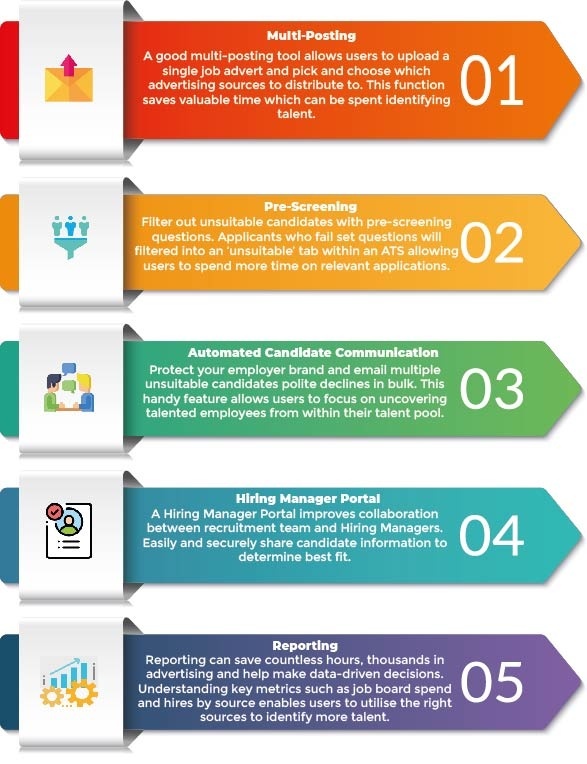 Talentvine's recruitment software has all of the key features required to improve recruitment performance. Multi-posting vacancies to your choice of job boards, manage candidates centrally and get critical insights into your recruitment performance. Discover more about Talentvine Pro here. Is your recruitment activity more like London buses? Need a quick, easy and cost effective way to hire talent? Priced at just £199 Talentvine's Essential Package allows users to multi-post to major job boards and manage candidates with ease. We'll even write and optimise your job advert. Discover more about Talentvine Essential. More of a traditionalist? Like what Recruitment Agencies have to offer? Talentvine's Managed Service is the Agency service you love, without the hefty price tag. Discover more about Talentvine's Managed Service Solution.